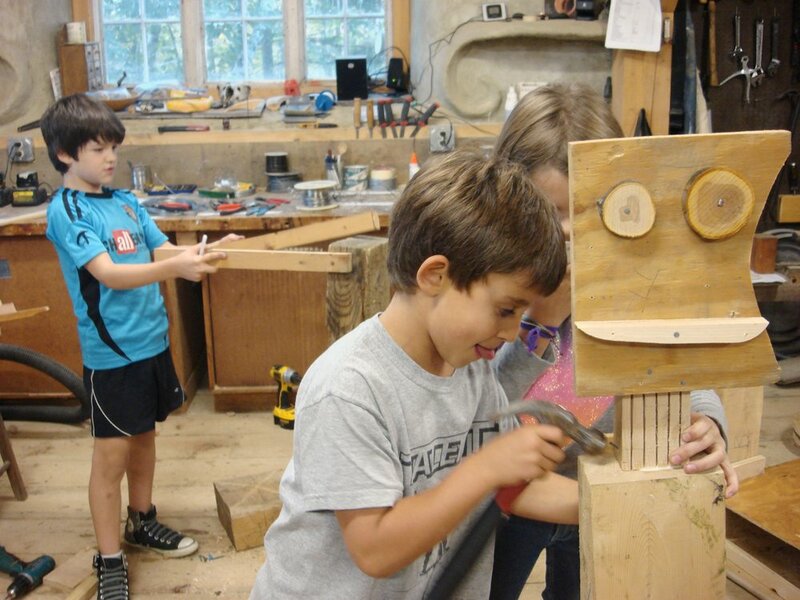 The first Sculpture School after school program occurred from September 30 - November 14, 2014. 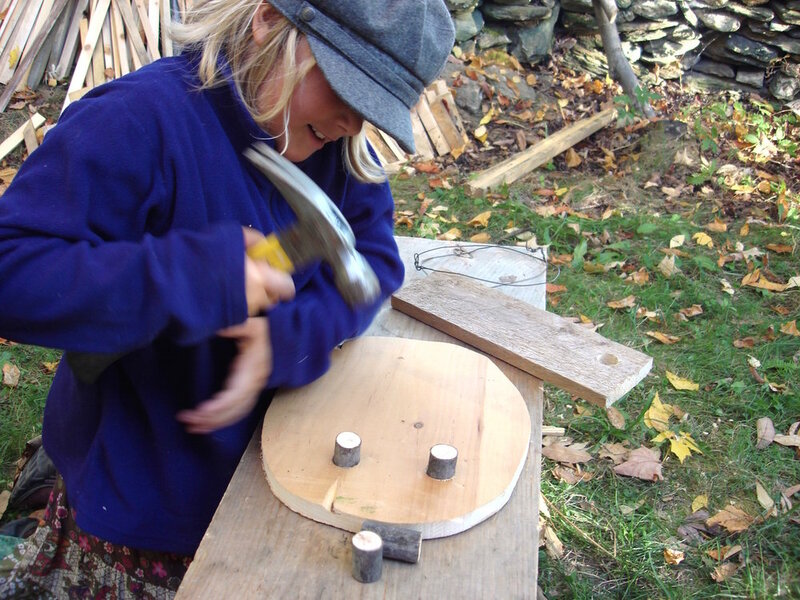 Throughout the 8 week program, kids ages 7-12 built life size sculptures and play structures at Knoll Farm in Fayston, Vermont. They learned building skills by working on large scale projects and gained experience working with power tools. All of the materials used in the course were salvaged from scrap piles around our community. This program was inspired by the sculpture gardens of Nek Chand in India and the yurts made by Bill Coperthwaite in Maine. On Tuesday afternoon we gathered at the Knoll Farm shop for our opening session. The first demonstration included a walk though of the shop and safety procedure for using drills, clamps and hand saws. The group applied their learning by deconstructing a bookshelf and improvising with pieces from the scrap pile. Tim made an axe from a couple pieces of scrap wood. After an hour of experimentation we grouped together and gave out the prompt for the first project – building a statue. They were given two perimeters 1.) it had to be their height and 2.) it had to be made out of pieces from the scrap pile behind the shop. They spent the remainder of the afternoon sketching ideas, gathering materials and making prototypes. The second group started the afternoon with a game in the forest. Their challenge was to find snacks that were hidden in the trees and then to figure out a way to reach them. With a 10 minutes time limit, the group had to act quickly. They decided to split into two groups, one would scout the area and the other worked on building a ladder. Their cooperative efforts were successful as they were able to find the rice cakes, apples and peanut butter before the time limit expired. 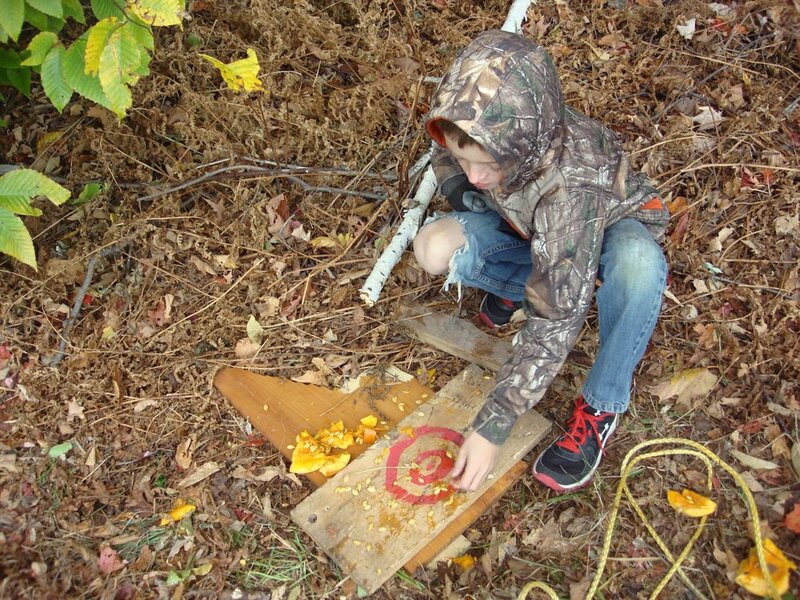 After snacking in the woods, we walked back to the shop for a tool safety demonstration. The group learned about the importance of clamping wood when sawing, and how to change drill bits. They quickly went to work, Hale and Will broke apart an old piece of furniture, while Annie cut up some branches to make eyes on a wood face. We started our second session with a pumpkin launching challenge. The group was provided a set of materials and a prompt to hurl the pumpkin at least 10 feet into an empty garbage can. They had rope, a milk crate, scrap wood and anything found in nature at their disposal. They put their heads together and decided to use a branch to create a makeshift pulley to hoist up the milk crate filled with heavy rocks. The milk crate would then come crashing down onto a plank of wood acting as a lever with a tree stump as the fulcrum. Everyone got a safe distance away and pulled the crate up above the lever then dropped the load catapulting the pumpkin into the trash can. Back in the shop everyone was immeresed in their projects. Levi felt the inspiration to make a table, Mia helped Jude attach a spine to his statue, and Tim began working on a book shelf. Round two of pumpkin launching turned into pumpkin smashing. Noah, Annie and Will devised their own approach to hurling the squash. 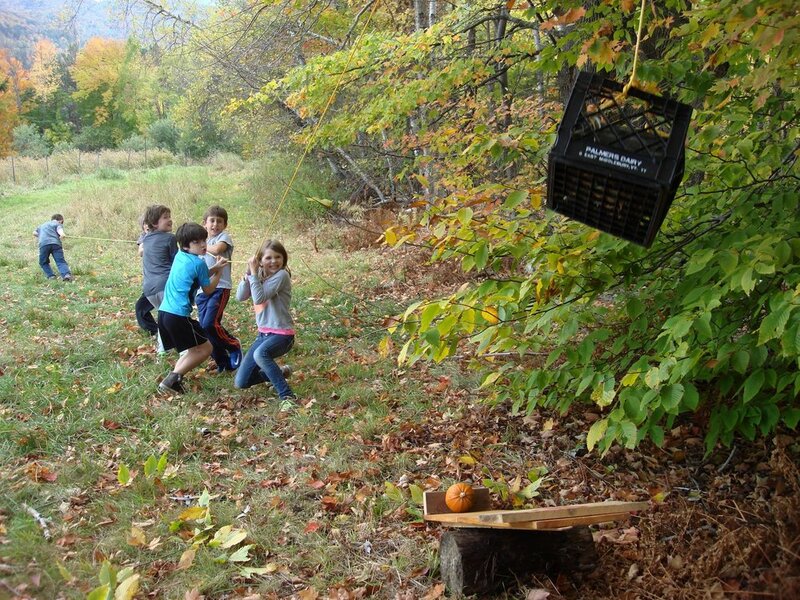 They decided to use a milk crate full of rocks to crush the pumpkin and send the seeds flying. After each drop they measured how far the seeds flew and experimented with varying heights and loads. After many laughs and screams we went back to the shop to continue working on our projects. 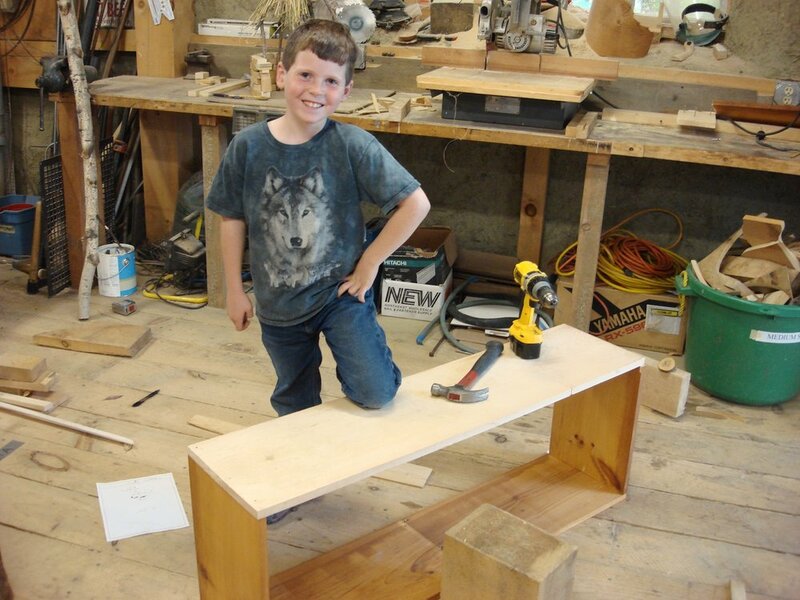 Will sized up his sculpture to make sure it was level and Annie drilled holes in a table leg to make a flute for a friend. 14 plastic bags full of leaves hung high in the trees – only one contained jelly beans. The group was prompted to search for the candy by only using 2x4's to knock the bags down. They were provided nails, hammers, twigs and 15 minutes to find the jelly beans. After the game we carried the 2x4's to the shop and used them in a demonstration on how to frame a structure. This collaborative project would be our second project and would be worked on simultaneously along with the creation of the statues. Jude's statue grinning in the shop. Annie, Will and Noah started off the rainy afternoon by repurposing materials to create a machine that would detonate a mouse trap in the middle of the shop. They were provided rope, different size balls, yoga mats, a stool, egg cartons and other recyclables to solve the challenge. After many iterations and some creative prototyping they managed to detonate the mouse trap using a marble and an 8 foot ramp. 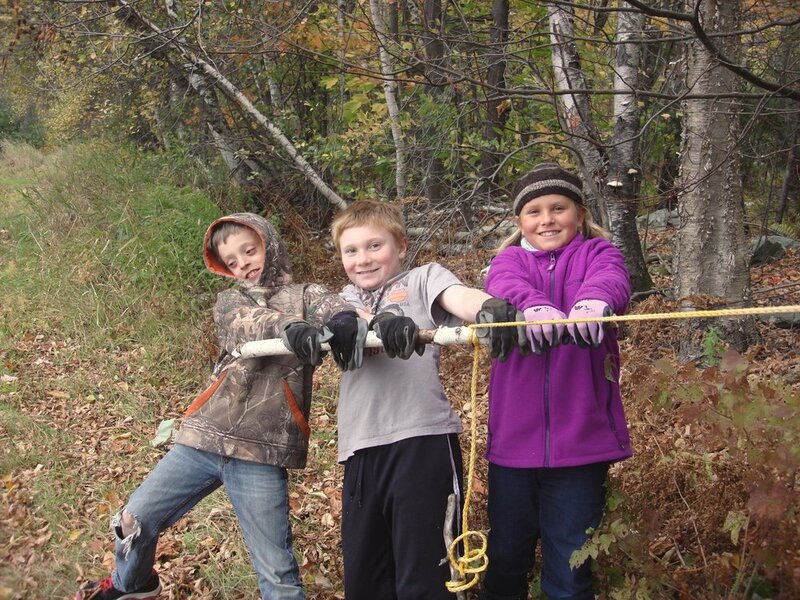 Noah, Annie and Will created an 8' marble track to detonate the mouse trap. After the challenge the group gathered for a demonstration on framing and were shown different kinds of lumber available for construction. At first they choose to make a square for the base of their structure but after some experimentation they rearranged their efforts to build a hexagon base for their collaborative project. Measure twice, cut once. Noah takes a measurement of one of the sides of the hexagon frame. Towards the end of the session the group shifted to working on their statue projects. Annie made lots of progress on her head and shoulders. She made eyes and a nose for here statue's face out of twigs. Will dug around the scrap pile to find some pieces to build arms for his project. The afternoon started with a collaborative effort on building a frame for our structure. The group worked in pairs holding up 2x4's and screwing them together to form a cube. Mia had an idea to make a front porch on the structure using saplings as posts. She went into the woods with Levi to scout out a tree with the right diameter. Within minutes they had a sapling down. Quinn came over to help drag it out of the woods and to finish cutting off branches. The second half of the session involved everyone working on their statues. Izzy and Wren worked together on cutting small pieces for their sculptures, while Jude focused on painting blue arms onto his project. Quinn changes drill bits as his scrap wood statue lies in the foreground ready to come to life. Everyone engaged on their projects in the fourth building session. Noah and Will continued working on their hexagon structure by by adding 2x4's at each corner of the base to form a frame for the walls of the structure. 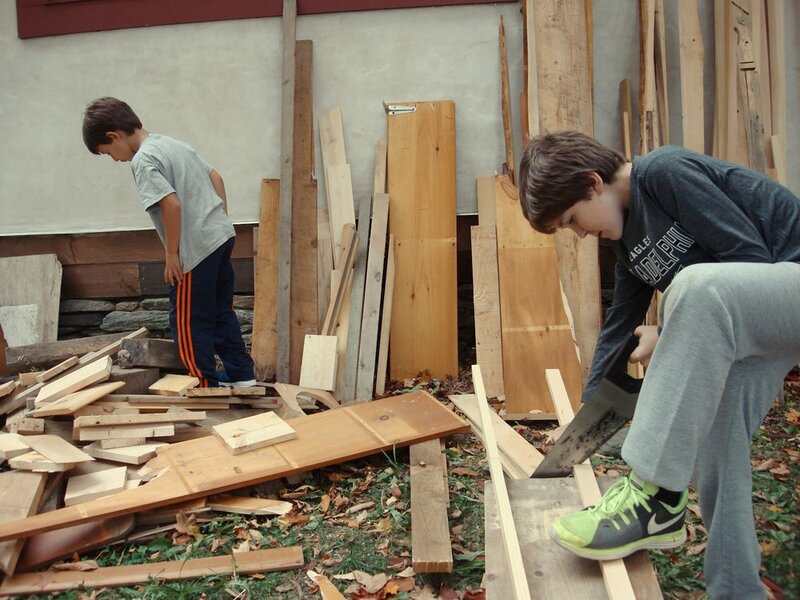 Earlier in the day the boys noticed some boards in the scrap pile that were burnt but potentially reusable. They walked back to the pile to have a second look and to take measurements. Upon closer inspection they decided that the boards would be perfect for the walls of their structure. They picked out what they could salvage and hauled the boards up to the shop. Back in the shop Annie decided to turn her project into a shelf, while Wren and Will painted their sculptures. Annie shakes hands with Eddie's genie sculpture. Annie stands proudly next to her in progress shelf project. After the game we set up some of our statues on the hill. Wren made a level platform for her sculpture to stand on so that it could enjoy the view. The rest of the group gathered around the cube frame to drag it out to the worksite. Mia and Jude take turns screwing on the wall panels. Our neighbors, Laura and Noel, donated a bunch of 1" boards that we repurposed as siding on the structure. The group worked together to line up and screw on each board onto the structure frame. Siding installed on three sides of the structure. Once the walls were completed the group assembled a roof frame out of scrap wood and branches. The group relocated their hexagon structure frame to the back of the shop to finish construction. Wren, Will, Annie and Noah drag the hexagon structure out of the shop. Materials which would be used to complete the siding of the structure were sorted by size at the construction site. The group repurposed salvaged wood for the siding of the structure. The wood was charred on one side but still structurally intact. They measure and cut each piece to fit all of the sides of the structure, leaving a gap at eye level for windows. Will stands next to his statue while Noah screws siding onto the hexagon structure. After finishing the siding the kids began framing the roof structure. They attached roof strapping to each corner of the frame and joined all of the pieces at the center. Then they screwed on horizontal pieces onto which they attached cedar shingles. In our 6th and final week we had some buttoning up to do on our structures. Todays emphasis was to get as many shingles onto the roof as possible. The group discussed a plan of attack and went straight to work on their tasks. Levi and Hale took the lead on finishing the front siding of the cube structure, while Noah and Will partnered on the roof of the hexagon. Everyone else filled in where they could and the afternoon was buzzing with hammers pounding and drills going off. Once it got too dark to work outside we came into the shop to put the finishing touches on our sculptures. Wren helped Hale screw on the head of his creation while Mia painted a sign for the exhibition with everyones name on it. We celebrated our last session by smashing some rotten pumpkins which were donated to us by a local farmer. The kids were hollering as they hoisted a milk crate full of stones up into the branches. "Five, four, three, two one!" They let go of the crate and smashed the seeds out of the squash. After messing around Annie and Noah went straight to the shop to finish their sculptures. Annie made a shelf for her room completely out of scrap wood and Noah put arms on his creation using dowels and made a face out of plywood and branch slices. The rest of the group was outside nailing on a few more shingles, making doors and building a ramp for the entrance of the cube shack. As the sun set we came back inside to clean up the shop and prepare for the exhibition to share our finished sculptures with parents and friends. After 6 weeks of play and hard work the kids were finally ready to reveal their projects with loved ones. Everyone enjoyed pizza while they viewed all of the strange and beautiful creations made by the group.